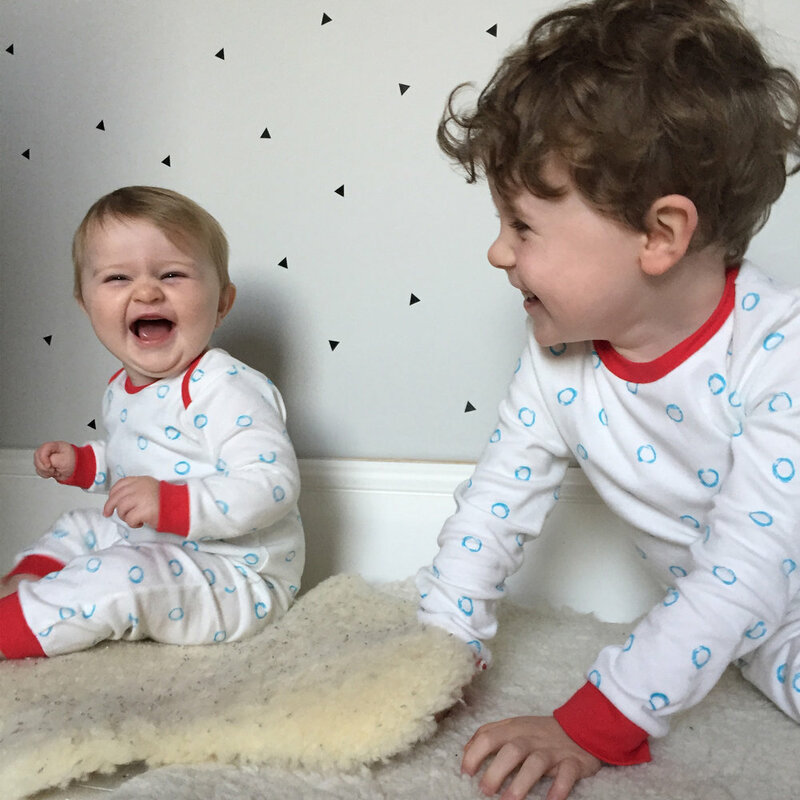 Panda & Ping sell beautifully made British sleepwear and interiors for children. They are a new, award winning company and we love them for their colourful, playful and unisex prints. Alongside the sleepwear they also sell bedding and blankets and make for great gifts for Christmas, Birthdays, new mums and baby shower pressies. 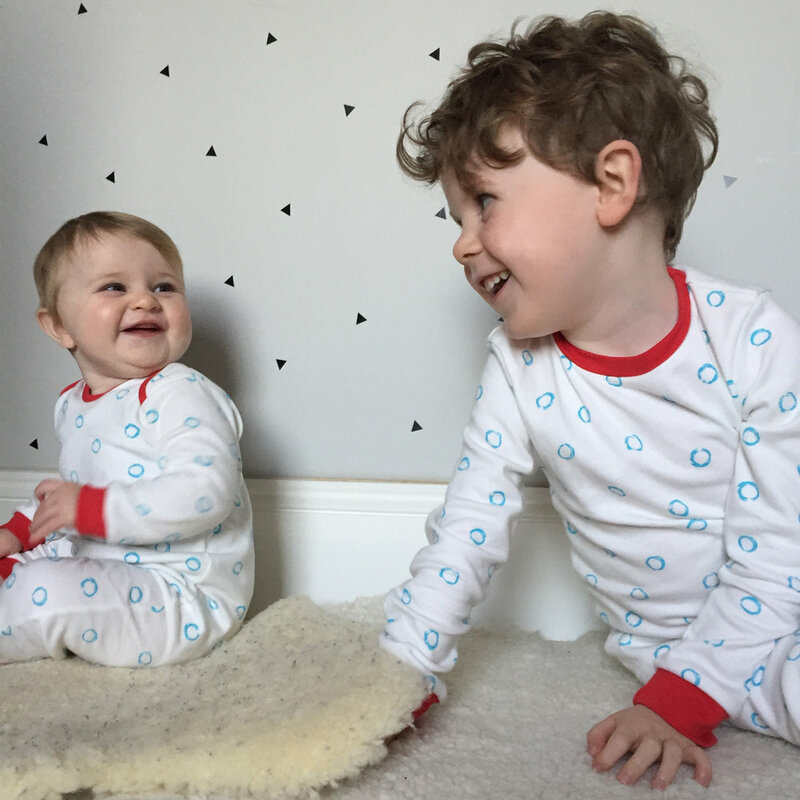 Violet is wearing the Ringo baby romper and Finn is wearing the Ringo Pyjama set. We love the soft cosy jersey and vibrant pop of red trim against the blue spots. The baby romper is footless which is useful for growth as her feet are quite big already! Originally from Scotland, Philippa, who set up Panda & Ping now lives in Berkshire with her husband and two small children. She describes herself as a tunnock teacake lover, lipstick wearing, obsessive handcream user, hair twiddling chattybox, who's quite fond of leopard print, cashmere and candles. She won't say no to a glass of prosecco or three! Mama to two blond bears, wife to one. Highlander at heart, still waiting for a dog.... I think she sounds like someone I'd like to hang out with!! What's behind the name Panda & Ping? So Panda is my childhood teddybear, I still have him and he’s very well loved. Ping the penguin was a gift from my daughter to her new sibling. We brought Ping a few weeks before the baby was born. She picked him and helped wrap it up. Are you a routine mama or relaxed mama? My daughter is super relaxed and chilled, whist my son needs and likes routine. So I guess a bit of both. I try to be a happy positive yet fair Mama. This doesn’t always happen! What are your top tips for kids bedtimes? A few drops of lavender in the bathwater, always smells lovely and it's soothing. Also nits hate lavender so it's a win win. What is bedtime like in your household? My daughter has a plethora of stuffed animals. She has a large blanket, which goes everywhere where her. Literally it's 99% DNA!! We bought a back up blanket but it was promptly rejected. It's like a military operation trying to get blanket in the wash machine! My son has a small blanket. As soon as we realised he was quite attached to it we bought two more and rotate them. He has teddies in his cot. What do your kids wear to sleep in? Obviously they both have a large number of Panda & Ping pj's. My daughter loves the new Fresh Aqua and purple Ringo pj's. What are you buying your kids for Christmas? My daughter loves anything arts and crafty. She’s asked to attend an art club. I might sign her up for some art lessons. My son…no idea he’s only 2 so this is the first year I think he’ll be really excited about it all. I’ll be trying as much as possible to buy from independent brands and stores. I really enjoy getting the house ready for Christmas. Putting up all the decorations and making it feel special and cosy. I love Christmas eve, the children get new pj’s and the fire on. This year we have great friends coming to spend Christmas so lots of children running around. Whats the best way to relax and unwind as a mama? If I'm completely honest I really struggle to relax. I like to spend time with people who don't make me want to look on my phone. I really love reflexology and a good facial. Honestly can't tell you the last time I had one. Which means I should book myself some mama time! Whats your favourite gift to give a new mama or mama to be? Practical and useful gifts are a must, from Panda & Ping our pram blanket with its matching bag and a romper. I also really recommend cloud b, sleep sheep. Total lifesaver with a newborn. For mama, some lovely face oil and handcream. My father gave me a litre bottle of gin when our son was born. I guess he figured I had everything already. Made me laugh. Whats your biggest or proudest achievement with your brand? We've been nominated for some awards, won two golds and two consumer choice awards. The Best Baby and Toddler Gear awards (by Mumii) we took home gold for our pj's and gold for Blanket 2016 for the Jumbo blanket. Which was just amazing. I cried. Recently we received two nominations in the Little London awards. Along with being shortlisted as 'Best New Brand' which was just completely overwhelming and lovely. The competition was really tough and whilst we didn't win it's was a great to run alongside some amazing brands. achieve balance and any tips for other working mamas? I'm not going to lie it has been possibly one of the hardest things I've ever done. I've questioned myself a lot, but I've also learnt a huge amount too. I've met some absolutely wonderful people, made lots of new friends and have worked with some brilliant brands. 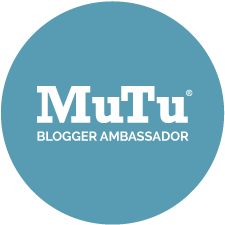 So unsurprisingly my top tip would be to build good relations with other brands, they will become your friends and your support network. And stay up to date with your accounting!! Thanks Pippa, you're doing a great job! 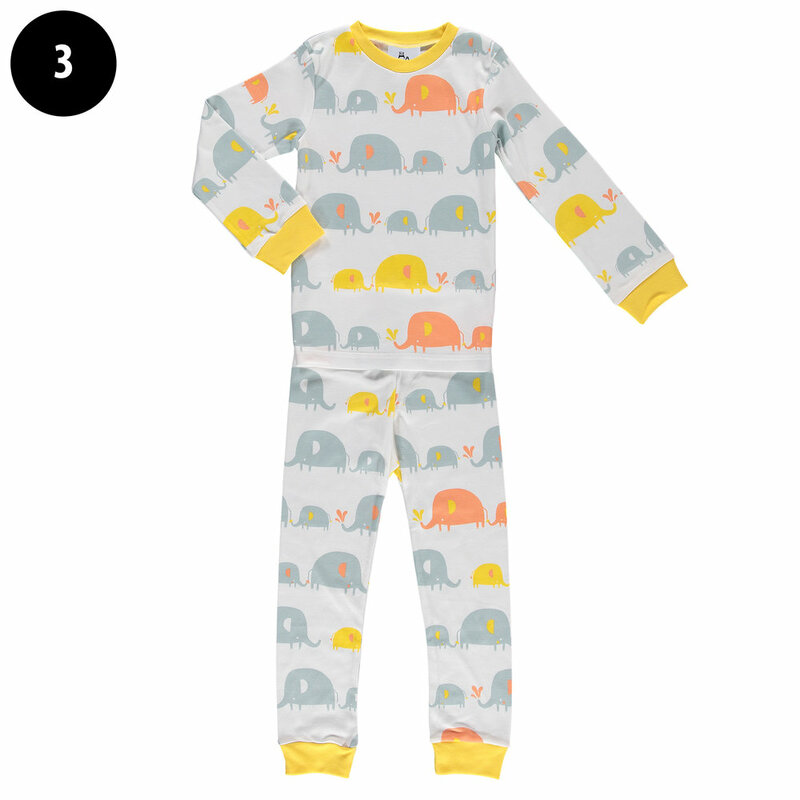 We picked our favourite pieces (including what the kids are wearing above of course) from Panda & Ping. They have 25% off from Friday 25th - 30th November as part of black Friday on selected products. Use the code BlanketFriday2016 at checkout. Please note this is a sponsored blog post but all opinions expressed are my own.